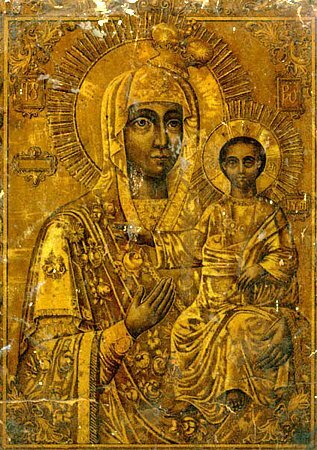 The Mozdok Icon of the Mother of God, a copy of the Iversk icon, was sent in the XIII Century by the holy empress Tamara as a gift to the newly-enlightened Christians of the Ossetian aul (village) of Mar'yam-Kadu. In 1768 this icon appeared remarkably on the banks of the Terek, not far from Mozdok. Bishop Gaii built a chapel for the icon. In 1796-1797 there was built at the place of the chapel a church in honour of the Uspenie (Dormition or Repose) of the MostHoly Mother of God, along which was soon founded a women's monastery (abolished together with the Mozdok diocese in 1799). At the end of the XIX Century the inhabitants of Mozdok built a splendid church in honour of the Mozdok-Iversk icon of the Mother of God. The Mother of God has repeatedly rendered speedy aid to the believing through Her holy icon.